1. Use fingers of your opposite hand to touch the outside edge of your eyebrow (furthest from your nose); trace with your fingers back over and around the ear; down the back of your neck, across the back of your shoulder; down the outside of your arm to the back of your hand; and finish by touching the fourth ‘ring’ finger at the base of the nail. 2. Repeat at least three times on each side of your body. 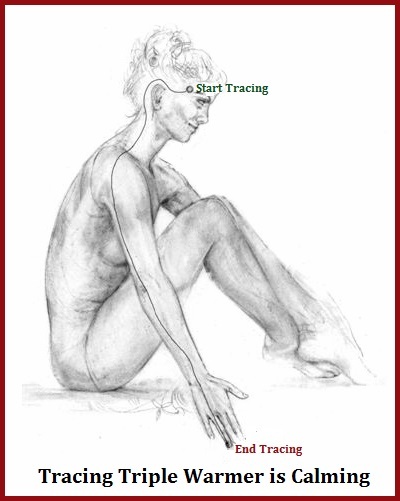 Continue tracing the Triple Warmer backwards as needed to help you relax and relieve stress. This is an exercise Donna Eden shares in her book Energy Medicine Balancing Your body’s Energies for Optimal Health, Joy, and Vitality. She tells us that having gratitude lifts our energy and is good for our health. We can choose to select one or all the chakras for channeling our gratitude and thanksgiving when practicing this exercise. Today we will concentrate on the Solar Plexus Chakra. Start by holding your hands over your third chakra (Solar Plexus). 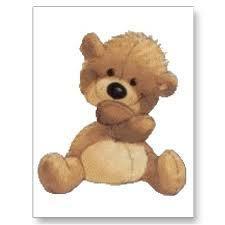 Bring your elbows to the sides of your body, hug and cradle the chakra like a baby. Bring your mind’s eye into the Solar Plexus and breathe deeply. Now is the time to send thanksgiving and gratitude to the chakra. 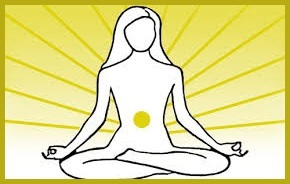 The Solar Plexus is often overactive, you can calm it with a ‘shhh’ like you would an infant. Your body will respond. Be open to the experience. Remember you can cradle and express gratitude toward any chakra! 1. Take a hairbrush that has strong bristles and tap your shoulders in a steady rhythm until you feel more relaxed. 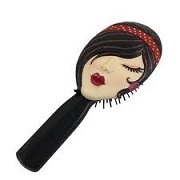 The bristles on the hairbrush are like prongs that can break up congested energy. 2. Standing, with your arms stiffened and hanging down the sides of your body, make fists, and lift your shoulders high, rolling your head back and to the sides. Repeat this half-circle motion for 15-20 seconds a couple of times each day. 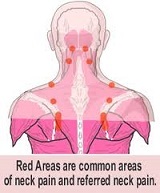 You are giving your neck and shoulders a natural massage that softens the knots, breaks up calcium deposits, and frees energy to move through the area. Have a great day! I am off to buy an inexpensive strong bristle brush. 1. Start with your thumbs on your temples, fingertips resting at the middle of your forehead, breathe deeply through your nose and out through your mouth. 2. Apply pressure and slowly pull your fingers apart stretching the skin across the width of the forehead. Continue to inhale through the nose, exhale through the mouth and repeat several times. 3. Place fingertips at hairline and repeat stretch pulling from the center of head down. 5. Move down to the shoulders and push your fingers in and hold. When ready release. 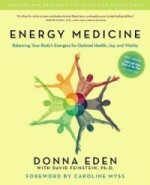 The book Energy Medicine Balancing Your Body’s Energies for Optimal Health, Joy and Vitality, by Donna Eden with David Feinstein, Ph.D. was first published in 1998. My copy is the Tenth Anniversary Edition which I refer to often for my own self-healing and working with my clients. There will be many of my future posts dedicated to Donna Eden’s wisdom and exercises she shares in all of her books. In Donna Eden’s books, Energy Medicine and Energy Medicine For Women, she recommends the ’Hook-Up’ exercise to do anytime your energies are feeling a bit “off”. The’ Hook-Up’ creates a connection between your central meridian (which sends energy up the front of your body) and governing meridian (which sends energy up your spine), bridging the energies between the front and back of your body and between your head and torso. It strengthens your aura and increases your coordination. This exercise is one of the most powerful tools to use to quickly center yourself. To do the ‘Hook-Up’, breathe in deeply through your nose and out through your mouth for 15 – 20 seconds. Place the middle finger of one hand on your third eye (above the bridge of your nose). Place the middle finger of the other hand in your navel. Gently press each finger into your skin, pull it upward, and hold for 15 to 20 seconds. Author states, “Often a spontaneous sigh or deep breath signals that the energies have hooked up.” Photo – Author, Donna Eden. It is nice to get to know more about the Meridians. In Donna Eden’s book, Energy Medicine for Women, she mentions that the Triple Warmer is one of the body’s most potent and least understood energy systems. It governs: 1.The immune system 2. The emergency response to threat (fight, flee or freeze) and 3. 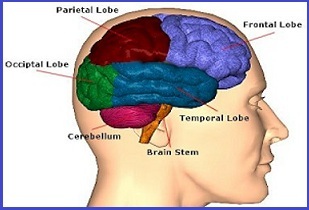 The ability to form physiological and behavioral habits for managing stress or threat. Donna has several Triple Warmer exercises which will be covered in my posts in the future. Today, we will look at the Triple Warmer/Spleen Hug. It is recommended to use this exercise anytime you are upset or need comfort. This position simultaneously calms Triple Warmer while energizing the Spleen Meridian: Wrap your left hand around your right arm just above the elbow. Wrap the right arm around the left side of your body, underneath your breast. Hold this position for at least three deep breaths. Reverse sides.